Tauros in game: 5,039 Who? Important notice! Pokemon Tauros is a fictional character of humans. 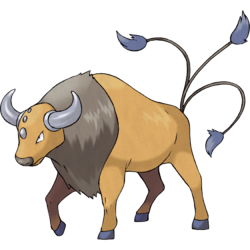 Tauros is a quadruped, bovine Pokémon. It is covered in light brown fur with a thick, darker brown mane around the neck. It has a rounded muzzle with a dark brown nose, and three gray bumps running vertically down its forehead. A pair of curved, gray horns grows from atop its head. Each of its three black tails has a tuft of fur on the end, and there is a single gray hoof on each foot. Tauros is a male-only species with no true female counterpart. Tauros is a violent, rowdy Pokémon that whips itself into a frenzy using its three tails. Once it starts charging, it is unable to stop or change course until it hits something. It lives and travels in herds on plains and grasslands. It will lock horns with others of its kind, and the herd's protector takes pride in its battle-scarred horns. Ash captured a herd of 30 Tauros in EP035, an episode which became banned in multiple countries due to use of guns, leading to confusion for many as to how he obtained them. The first time Ash ever used any of his Tauros in a battle was against Drake of the Orange Islands in Hello Pummelo. A Trainer's Tauros appeared in The Mandarin Island Miss-Match. Ethan used two Tauros to pull his stagecoach in Get Along, Little Pokémon. Many Tauros were seen in Tricks of the Trade in Palmpona Town, including one under Fernando, the Trainer who managed ten consecutive victories in the tournament. Ash brought his from Oak's for this occasion as well, managing to defeat Fernando. Ash used his Bulbasaur to stop an out of control Tauros in Two Hits and a Miss. Tauros first appeared briefly in The Flame Pokémon-athon! as one of the Pokémon in the Laramie farm. Multiple Tauros appeared in the intro to Mewtwo Strikes Back being captured by Team Rocket Grunts with the aid of Mewtwo. A Tauros appeared in Lights, Camera, Quack-tion, as part of the cast for the movie "Pokémon in Love". A Tauros appeared in Beauty and the Breeder where he participated in a Pokémon breeding competition. Mr. Shellby owned a Tauros in Extreme Pokémon!. Multiple Tauros went on a rampage in A Tyrogue Full of Trouble after being startled by a troublesome Tyrogue. 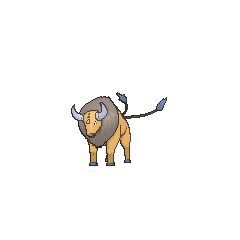 A Tauros was used by a Trainer in a qualifying match for the Silver Conference in A Claim to Flame!. Multiple Tauros made brief cameo appearances in Destiny Deoxys and Giratina and the Sky Warrior. 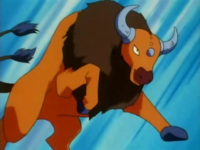 A Tauros is used by one of the students of Pokémon Summer Academy in the first leg of the Pokémon Triathlon in One Team, Two Team, Red Team, Blue Team!. A group of Tauros appeared in Historical Mystery Tour!. A photo of two Tauros appeared in The Four Seasons of Sawsbuck!. 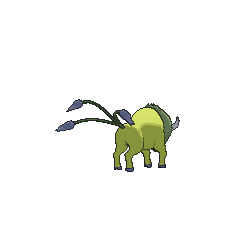 A Tauros appeared as a mask for the festival in Capacia Island UFO!. 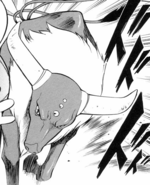 A Tauros appeared in The Legend of the Ninja Hero!, where it was used in the Ninja Village. Three Poké Ride Tauros appeared in SM009. Multiple Tauros appeared in SM011. Red's Tauros appeared in File 4: Charizard, where he was briefly shown battling Zapdos at the Power Plant. 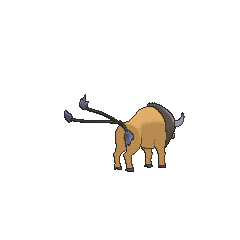 In Tauros the Tyrant a Tauros, apparently captured in the Safari Zone, was used as a mount by members of Team Rocket. By whipping his tails, he was able to control the Pokémon of the other Team Rocket Grunts, a method that Green easily exploited by pushing it off a cliff and having Ditty mimic its appearance. He was later used in Great Girafarig to chase after Suicune, only to be defeated after Eusine's Jumpluff had Leech Seeded him. Pearl later captures a Tauros, adding him to his main team and naming him Tauler. 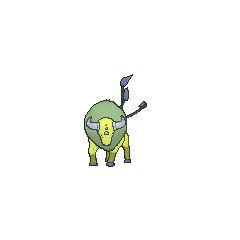 A Tauros appeared in the Sun & Moon chapter, called by Sun via the Ride Pager, to help with deliveries in his job as a courier. Tauros is an abbreviation of its Japanese name, Kentauros. It is worth noting that Taurus, Latin for bull (which comes from the Greek tauros), is the name of a constellation representing a bull. 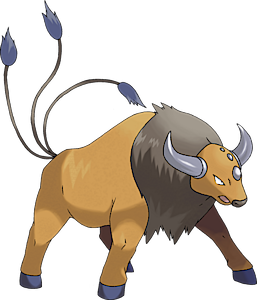 Tauros could also be a corruption of Toro (Spanish for bull). Kentauros is derived from the Japanese ケンタウロス centaur, which itself derives from the Greek Κένταυρος. It could also be a corruption of Centaurus, a large south-sky constellation representing a centaur.